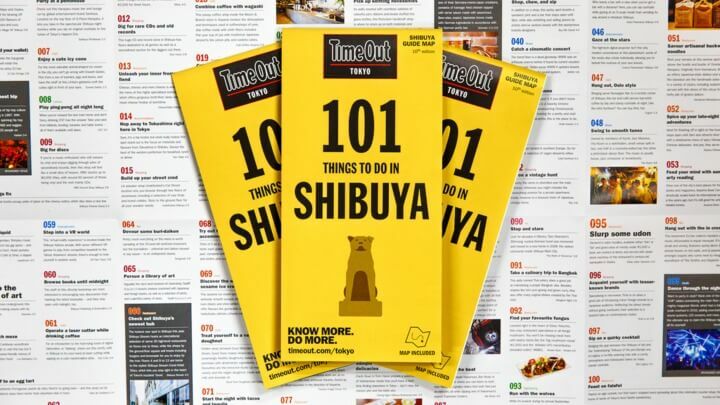 The much-anticipated 10th edition of Time Outs’ 101 Things to do in Shibuya has been released. The English guide map has been published every year since 2012, detailing a whole heap of useful and interesting information for those interested in sightseeing one of Tokyo’s most popular locations. The new volume includes information on newly-built shopping complexes, the latest restaurants to hit Harajuku, the best bars to visits and more. When Time Out launched 101 Things to do in Shibuya there were hardly any guides in English on Shibuya. There were many requests a guide map from foreign tourists during this time. Still today Time Out’s guide map series of Tokyo is the most popular. New famous spots showcased on the map include the shopping complex Shibuya Stream which opened in September this year, the renovated MAGNET by SHIBUYA109, the music bar and lounge Sankeys PENTHOUSE, the conveyor belt dessert cafe MAISON ABLE Cafe Ron Ron and more. Also featured is a list of hot restaurants in Harajuku such as the popular soba noodle bar Matsubara An. The pro of 101 Things to do in Shibuya is that it is written by native English speakers who are able to write about Shibuya’s many faces from a foreign perspective. The location line-up also includes many spots selected from a local perspective. The guide map is free so pick up a copy yourself and find out all the information you need on tourist information centers, hotels, cafes, bars and more.